Guest Blog Post by: Graphic Moxie – the most creative Design Agency on the East Coast. 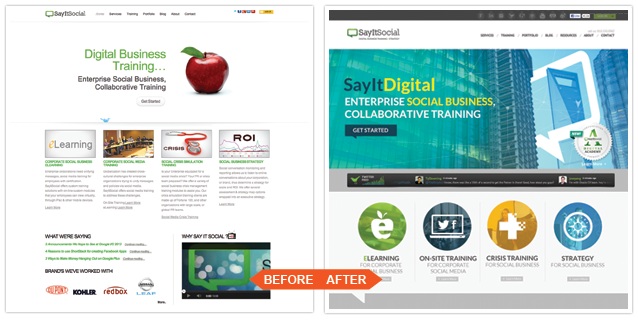 Graphic Moxie wrote this article on their own blog after redesigning the SayItSocial website. Take a peek for yourself! 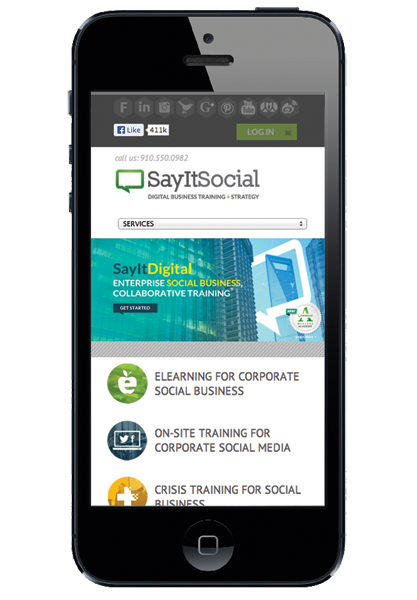 April 30, 2013 – Successful digital media training and strategy agency, SayItSocial, is a real mover and shaker in the industry. Its team helps companies like DuPont, RedBox, ARAMARK and Anheuseur Busch learn to leverage the power of social media on a global scale. In just a few years, the small but mighty agency has amassed the influence, client list and capabilities of much larger firms. It was Graphic Moxie’s pleasure and privilege to work closely with the core SIS team to design and develop a website that reflects the impressive reach and scope of their work, showcases their talents and services and works as hard as they do. Oh, and it looks super darn cool, too. Graphic Moxie went to work creating a new look, feel and function for SayItSocial – one that merges its boutique-style level of service with its expansive enterprise capabilities. Starting with a WordPress theme, we used custom photography and illustrations to develop a robust and totally responsive web design that is visually striking, easy-to-navigate and SEO-friendly. The result is a clean, cross-platform compatible and highly customized site with social media feeds and video integration throughout. And, since it is built on the WordPress platform, the folks at SayItSocial can easily control updates and add new content with the easy-to-use CMS. We learned a lot on this project and had a ton of fun working with the SIS team. We are pretty darn proud of this one (c’mon – we can toot our own horn once in a while). Cruise over to www.sayitsocial.com and take a look. You might just learn something, too. Also visit our newly listed DuPont, Springer case studies, and our NEW SayItSocial Digital Academy!